I love Neutrogena's sun protectants. I use this all over my body. It protects me and I get a streak free tan as well. LOVE! 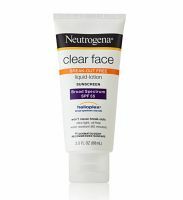 Between this Neutrogena face sunscreen and the high-end ones at Sephora and department stores, this one beats it by far. I wouldn't necessarily say ALL Neutrogena products take the cake, because I really don't like many of their products. BUT, this sunscreen doesn't leave a white film on my face like most sunscreens do. I live in a hot and humid climate, so the last thing I want is a thick sl...read moreather of white goo seeping into my pores....yuck! This is lightweight and I have only burnt a little on my nose because I forgot to re-apply after a long day in the hot sun. Bottom line, I paid about $9.50 for this at Target and it has not done me wrong at all! I love it! This is my summer staple. Strange, I still haven't reviewed this. I finish a tube of this each summer. I recently ordered my tube for this summer. This is probably the best sunscreen I have ever used. I am not going back to another one. This sunscreen has never caused me any breakouts. This is actually oil free and helps my face feel clean. I recently used another sunscreen and I broke out all ove...read morer my face and I realized how much I love this sunscreen. I am medium skin toned and I think SPF55 gives me complete sun protection.